Last week I was invited along to the launch of Sophie's Rustic Ale at The Bricklayer's Arms in Putney. 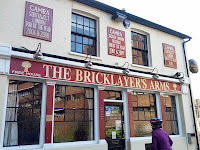 This was my first visit to this award-winning pub, tucked away down a side street close to Putney Bridge. On walking in, my first impressions were of a cosy, traditional country pub that had somehow got lost on its way to the countryside and settled on this quiet residential street in South West London. Maybe it was enroute to Berkshire but couldn't escape the clutches of the M4 elevated section. 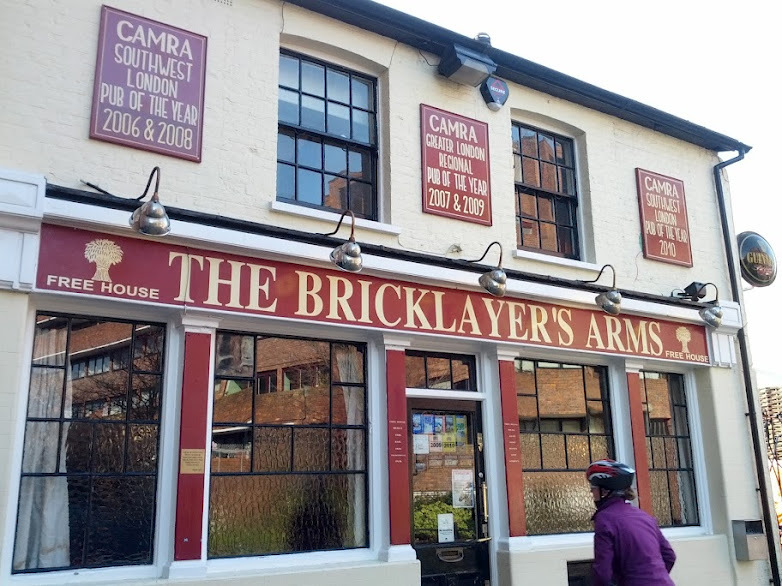 In any case, its horse-shoe bar covered in hand-pulls with a smattering of keg lines was a welcome oasis after skipping past the wine bars and chain pubs on Putney High St. The pub positions itself as "London's Permanent Beer Festival", a free house which takes pride in offering customers an array of choice and beers they might otherwise not find elsewhere. For example, later this month they are hosting a Kent Beer Festival, which offers Londoners a chance to try the beers brewed as part of the Kent Green Hop festival, where Kent's brewers turn their skills to brewing a beer made with freshly picked hops, harvested from the county's local farms. Sophie's Rustic Ale is the result of a collaboration between Dorset's Art Brew and beer writer, journalist and recently qualified beer sommelier Sophie Atherton. Sophie worked with Art Brew's Becky Whinnerah to devise the recipe after they'd decided to brew a beer inspired by the Belgian Saison style. Their challenge was to bring the influence of Dorset's farming history into their interpretation of this traditional Belgian farmhouse style. Sophie's research led her to learning that marigolds were grown in the area in Victorian times. After discussing this with Becky and conducting a few tests to see what flavours they would bring to the mix, the two agreed to incorporate dried marigold flowers into the brew, looking especially to bring the distinctive aroma to the fore. The marigolds were added to a recipe which also includes Maris Otter barley, East Kent Goldings and Challenger hops and Saison yeast (actually a blend of yeasts, as explained on the night). Two versions of the beer were presented, fined and unfined. I tried the fined version first. It felt odd being presented with a perfectly clear Saison. The fined version had a sweet floral nose. The taste presented a very dry beer with fruity notes being followed by a hop bitterness and hints of green apples. The dryness was in tune with the Saison style but I couldn't pick out the distinctive fruity and spicy flavours the yeast typically brings to a traditional Saison. 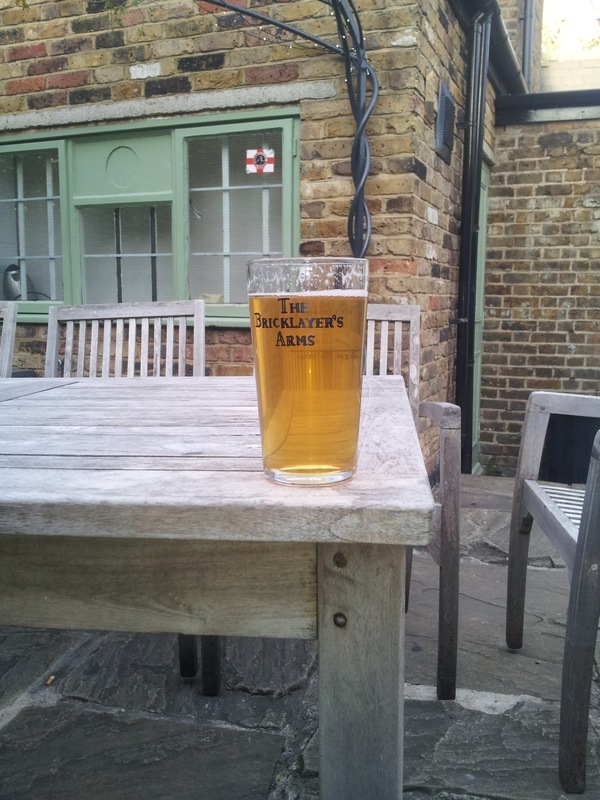 The unfined beer for me was much better. The flavour profile I'd associate with a Saison was thrown into the mix with the dryness and floral notes being retained - very enjoyable. This was the first time I'd tried cask conditioned Saison, in fact the only draught dispense I'd had before was Saison Dupont in keg. Without the fizz of carbonation to lift it, the dryness of both was prominent, which was going to make our challenge for the evening - matching the beer with food - an interesting test for my palate. 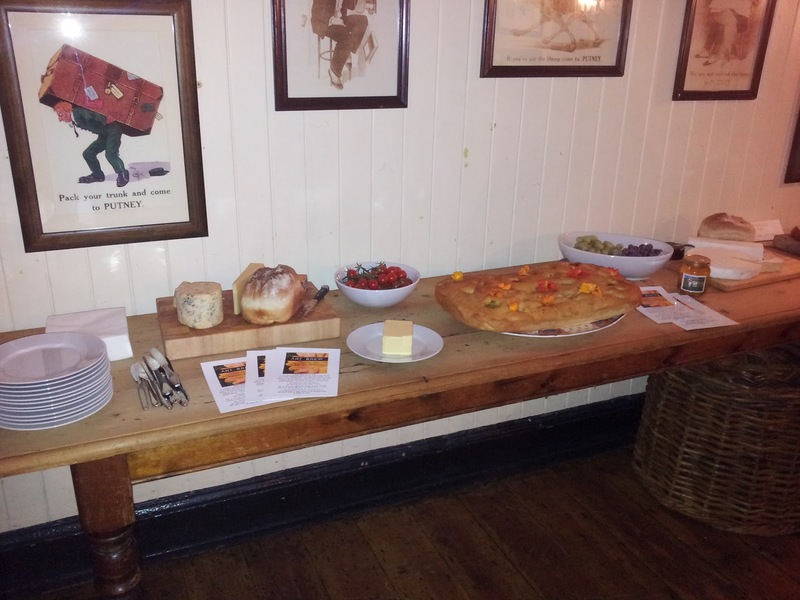 To that end, our hosts had provided a delicious array of bread and cheese from the South West to sample alongside the beer, curious to hear our views on which best sat alongside the flavours in our glasses. 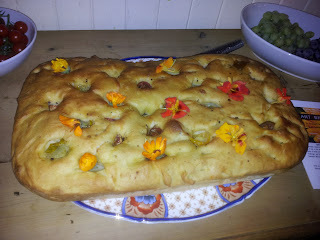 The focaccia recipe had been designed by one of River Cottage's chefs specifically to match the flavours in the beer. It was perfectly presented, topped with marigolds and green tomatoes. This was a real treat and provided a great accompaniment to the cheese. As I set about tasting the cheeses alongside the beer, it struck me that this was a delightful way to spend an evening, talking all things beer with like minded folk and comparing notes on what provided the best match. After dutifully working my way through sampling everything on offer (well, I do aim to be thorough!) 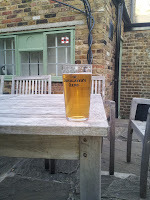 along with a few more halves of the unfined beer, I felt the best match for Sophie's Rustic Ale was the Jalapeno Jack from Hawkridge. As the chilli heat from the peppers started to warm the palate, washing a swig of the ale around the mouth presented a completely different beer and really accentuated the spicy, fruity notes brought by the yeast, lifting the dryness away beautifully. It has to be said the Blue Vinney also worked really well for me too, although I may be biased there as I'm a huge fan of that particular cheese. All in all, it was a thoroughly enjoyable evening, hosted impeccably by Sophie and Becky and John from Art Brew, with the Bricklayer's Arms providing the perfect venue. Sophie's Rustic Ale will be available in London and in Reading, Berkshire in the coming weeks. I'm not sure where specifically but if you'd like to try it, drop Sophie (@SophWrites) a tweet to find out where to go.